For one night only, the ballroom of the Oxford Hotel transforms for Volunteers of America's Annual Red Wine & Seafood event! Fresh seafood and deserts will be provided by the Urban Farmer Denver, a modern, seasonally-driven restaurant that focuses on in-house whole animal butchering. 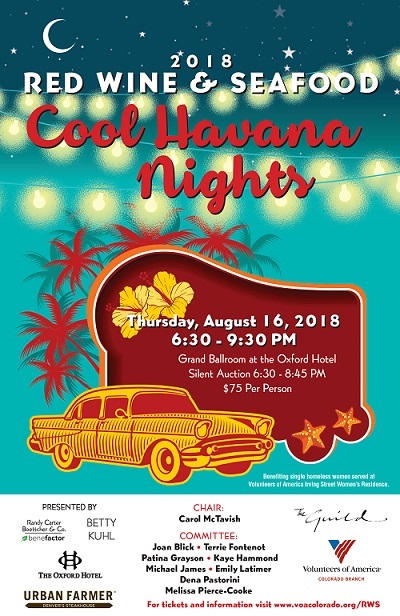 In addition to culinary masterpieces, expert wine pairings, and a wine pull, there will be a silent auction featuring sports collectibles, weekend getaways, and more! Proceeds benefit single, homeless women served at Volunteers of America Irving Street Women's Residence, a space helping women in our community who are facing homelessness or financially struggling to get the food, shelter, and caring support they need. BUY YOUR TICKET BEFORE AUGUST 1ST FOR A FREE YEAR-LONG SUBSCRIPTION TO 5280 MAGAZINE! YOU MUST FILL OUT THE SHIPPING ADDRESS WHEN PURCHASING YOUR TICKET TO GET MAGAZINE DELIVERY.